Paul Gauguin, The Ham, 1889 (detail). Oil on canvas, 19 3/4 x 22 3/4 in. The Phillips Collection, Washington, D.C. Acquired 1951. A brief story in the Washington Post about the health value of onions (“nutritional powerhouses” according to Runners World magazine) made me think of one of my favorite works in the collection. 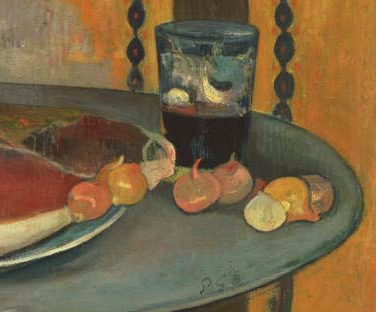 Those little onions in Paul Gauguin’s painting The Ham (1889) set next to the slab of ham have long been the subject of folk lore and even folk medicine. According to the article, onions “help protect the brain, keep the heart healthy, strengthen bones, reduce cancer risk and aid digestion.” The rosy pink color of Gauguin’s onions indicates that they are likely Roscoff onions, a distinctive and popular crop in Brittany, historically sold by men called Onion Johnnies, who hung bunches of onions by their braided stalks from the handles of their bicycles.